U.S. Aerospace Corp. provides maintenance, repair and overhaul for a wide array of Bell 214 aircraft parts and components, including and not limited to avionics, instruments and gyros, radio, radar, gauges, air data instruments, and accessories. 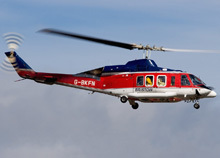 Simply search through our Bell 214 capabilities list below. We are continually expanding our capabilities, so if you do not find your preferred part number in our capabilities list, feel free to call us at 731-645-9988. For a price quote, click the RFQ button in the right-hand column. For your convenient offline reference, download a searchable PDF file of our Bell 214 capabilities.